In recognition of service to the Northeast Brookhaven community, the Rocky Point Rotary Club and the Rocky Point Lions Club held a combined reception to honor citizens of the year on Thursday, March 25, 2010 at The Majestic Gardens in Rocky Point, New York. 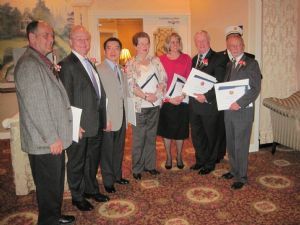 The honorees this year were area volunteer firefighters, People of the Decade; Mike Poveromo, business; Kathy Rousseau, environment; The Hon Thomas Spota, government; Dr. Steven Strongwater, medicine; Ralph James & Yonggang Cui of Brookhaven National Lab, science; Tom Talbot, civics; Paul Infranco, educator; and Edith Tilley, ambulance service. Suffolk County Legislator and Minority Leader Daniel P. Losquadro awarded Proclamations to the People of the Year at the dinner. This is the seventh year the clubs joined together to honor outstanding service to the community. Rocky Point Rotary is especially proud of Rotarian Tom Talbot who was the 2009 Community Leader of the Year. A feature story about Tom follows in this column. Pictured here are the honorees in attendance with their proclamations.